Bark Brown branches across a Azure sky make a pleasant repose for these often seen backyard birds, early morning visitors. 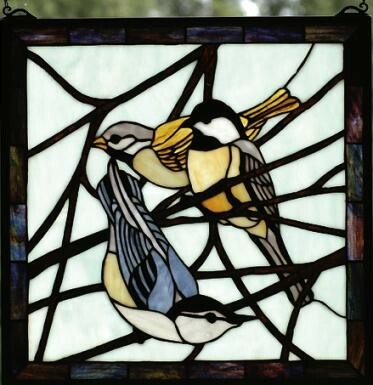 The Chickadee Stained Glass Window is an original design, handcrafted utilizing the copperfoil construction process and stained art glass. The artwork is set in a solid brass frame.